Today, I'm going to be doing the New Years Reading Resolutions Book Tag. 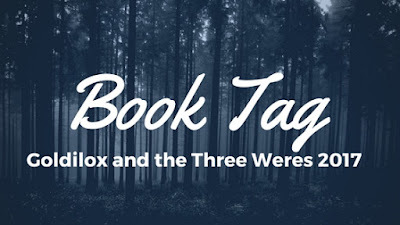 I originally saw this tag on Jesse the Reader and BooksandLala's channels. The tag itself was originally created by Charr Frears. This tag is a fun way to share some of the books I want to read in 2017. I did put the additional restriction on myself that I had to use books from my TBR pile and no 2017 releases which is okay because I have a quite large pile of owned but unread books. So let's get on to the questions and I'll tell you about some of the books I want to get to this year. 1. An Author You'd Like To Read (That You've Never Read Before). I'm kind of ashamed that I've never read anything by Alexandra Bracken before now especially since I've bought her books on kindle over the years as they've gone on sale. I even have her YA Star Wars book. But I'm going to remedy that this year by marathoning her Passenger duology. I've heard so many great things about these books that I'm excited to read them. Plus, they're time travel books! 2. A Book You'd Like To Read. There's so many books I could use for this prompt. Truthwitch. A Gathering of Shadows. The Scorpio Races. Updraft. These Vicious Masks. I could keep on listing books but the one I'm going to use for this one is The Dark Days Club by Alison Goodman. My best friend got it for me for Christmas and he sold it to me as a "Regency Buffy who hunts demons". I'm totally sold on that premise! 3. A Classic You'd Like To Read. One of my favorite movies when I was a kid was The Last Unicorn. I adored it and wore out my family's VHS copy. I've never read the book it's based on. I've read the graphic novel with it's lovely illustrations but never the book. And I've owned it for YEARS. I'm hoping to finally get to this one in 2017. 4. A Book You'd Like To Re-read. I started Megan Whalen Turner's The Queen's Thief series right after the fourth book came out in 2010. I loved everything about it and I've been waiting for book five ever since. And it's finally coming out! I'm planning on rereading the whole series before Thick As Thieves releases in May. I'm so excited to read these again! Eugenides, I have missed you! 5. A Book You've Had For Ages And Want to Read. I have owned a copy of The Night Circus since it came out in paperback back in like 2012. I'm not sure why I haven't picked this up yet because I'm still excited for it years later. Hopefully, 2017 will be the year I get to mark this book as read on Goodreads. I recently picked up the audiobook on the recommendation of a friend who says it's fantastic. I can't wait to see what I think of it. 6. A Big Book You'd Like To Read. Yeah... I still haven't read Winter. I know! I know! I've heard nothing but great things about it. I'm just not ready for the series to be over. I love it so much! That and it's been so long since Cress came out that I need to reread the first three books so I can remember everything. I tried to start this book last year and I was a bit lost because I had forgotten so much. This year I'm going to finally finish this series. 7. An Author You've Previously Read And Want To Read More Of. I read my first Brian Selznick book last year and I adored it! If you haven't read The Marvels yet, you need to change that! I was so taken with that book that I immediately went and bought his other two books. I never got around to reading either of them but I'm planning on reading The Invention of Hugo Cabret for book club in April. I'm intrigued to see how his other books compare to The Marvels. I've heard nothing but excellent things about Simon vs. The Homo Sapiens Agenda so when I got in my #TBTBSanta exchange package for Christmas I was ecstatic! I can't wait to see why everyone loves this one! I hear it's adorable and it is a LGBTQ+ book. Yay! For diverse books! 9. A Series You Want To Read (Start and Finish in 2017). One of my favorite movies in high school was Miyazaki's delightful and beautiful portrayal of Howl's Moving Castle. I adore it still. It was recently brought to my attention that the movie was based on a trilogy by Diana Wynne Jones. I got them for Christmas and I'm so excited to read them! I hope the book is as magical as the movie! 10. A Series You Want To Finish (That You've Already Started). I know I said I wasn't going to count 2017 releases in this tag but I'm going to make an exception for this tag. I read A Darker Shade of Magic when it came out in 2015 but haven't read A Gathering of Shadows. I've been waiting for the last book to come out before doing so thanks to some advice from some friends. I'm SO excited to finish this series this year! I want to know what happens! Officially, my Goodreads goal is set at 52 books which is a book a week but I'm hoping to read at least 150 books this year. Wish me luck! I have two specific goals in mind. By the end of 2017, I want to have read every physical book I pre-ordered this year. I only have 16 so far and I've read two already so it shouldn't be too hard to do. My other goal is to reduce my physical TBR pile. As of this post, I have 233 unread books on my bookshelves. I'm hoping to get that number down to somewhere between 175 and 200. I'm participating in the #RockMyTBR reading challenge to help motivate myself to meet this goal. What books do you want to read this year?